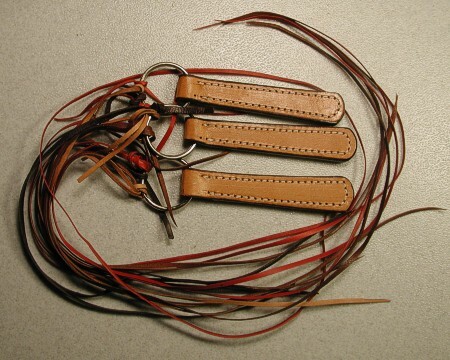 The key kits pictured below come with key fob blanks and precut roo strings. The braider will need the following: 1) The Art of Braiding, The Basics (either edition), fid, scissors or knife, white saddle soap, bone folder, finishing stick and leather finish, if desired. 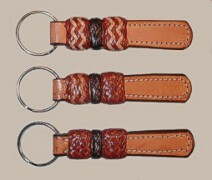 These key fobs are offered as kits. 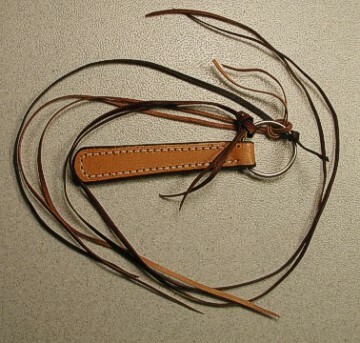 Each kits includes the key fob, precut roo strings (see below) and detailed instructional page on the following topics: buttons in design; pages in the book that correspond with the directions for a button; sting identification for each button, size and how to make groundwork for a button. 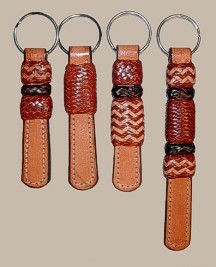 These key fob kits are available in a group of 3 or as single kits. Click Group A for larger photos and to order online. The key fob kits at the right are available as a pair or as a single kit. Click on Group B to view larger photos and to order online. The key fob kits at the right are available as a pair or as a single kit. Click on Group C to view larger photos and to order online. The key fob kits at the right are available as a pair or as a single kit. Click on Group D to view larger photos and to order online. The two kits in this group offer a variety. Group E-4 offers one key fob from each group. 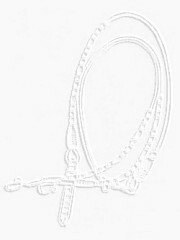 Group E-9 contains all key fob kits from Group A - D.
Key fob kit with precut roo strings.